Devaluation is now the preferred tool to reinvigorate slowing economy. On a traded-weighted basis, the US dollar is at its highest level in over a decade. Resource-based countries have seen their currencies tumble by as much as 25% and manufacturing-based economies as much as 20% in the last 12 months. The Japanese yen, the Russian ruble, the Brazilian real, the Chinese yuan and other Asian emerging economies have all adopted a policy of allowing their currency to float downwards , principally to stimulate exports. There is a race to the bottom as nations no longer can rely on monetary policy to promote growth - the last resort is devaluation of one’s domestic currency. As Sherlock Holmes famously said, ‘The game is afoot’. Canada joined the crowd when it cut its bank rate, for the second time this year, signaling that the loonie was overvalued and needed to find a much lower level to stimulate growth through exports. Since July 2014, the loonie has depreciated nearly 25% against the US dollar, appreciated slightly against the Euro, and has weaken against the British pound (see Charts 1 and 2). Turning to Asia, the loonie has appreciated against the Chinese yuan. Japanese policy has resulted in a more volatile exchange rate pattern, yet the Canadian dollar is roughly back to its level of a year ago and continues to remain stable against the yen (see Charts 3 and 4). Chart 5 reveals how precipitously Canada’s trade balance went from a healthy surplus of over C$ 2.2 billion in July 2014 to a deficit of over C$ 3.3 billion in May 2015. The progressive widening of the trade balance is very worrisome to a nation that relies on 30% of income from international trade. As a major commodity producer, Canada was hit hard with the drop in world oil prices, accompanied by price declines in natural gas, non-metallic minerals, metals, forest products and basic agricultural products. Manufacturing, especially auto vehicles and parts, play a large role in Canadian exports. Canada’s position in the North American auto industry has also declined. More on this later. 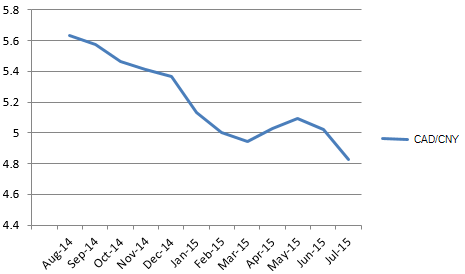 More troublesome is that Canada’s terms of trade have progressively weaken over the past year. 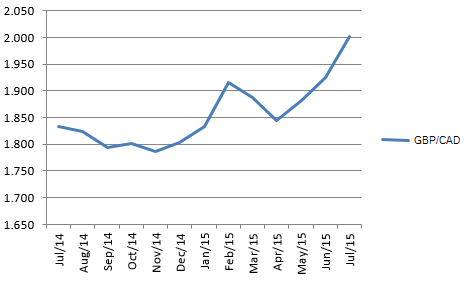 The terms of trade is defined as the ratio of export prices to import prices. The terms of trade are heavily influenced by exchange rate movements. While globalization has resulted in lower import costs, the terms of trade continue to go against Canada. 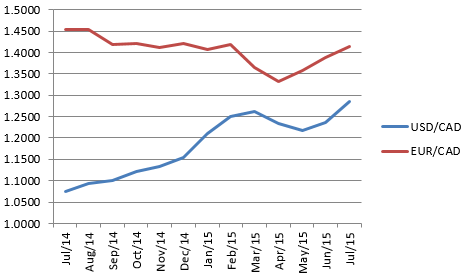 This suggests that real issue concerns the declining value of Canadian exports (see Chart 6). Should oil prices continue their decline, the terms of trade will further weaken, putting additional downward pressure on the loonie. 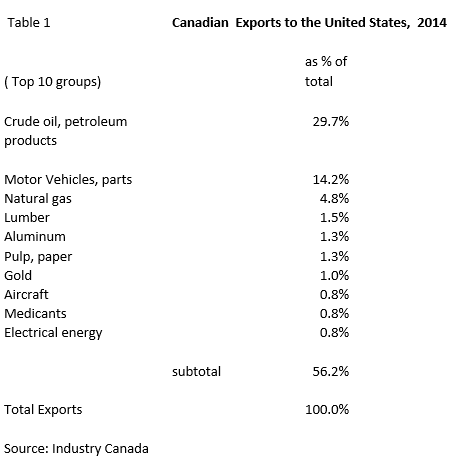 Canadian exports to the US are very narrowly confined to two broad sectors. Oil and gas dominate natural resources exports, while automotive vehicles make up the bulk of manufacturing exports (see Table 1). The International Energy Agency expects the oil supply glut to extend well into 2016. Global supply will exceed global demand by 1.4 million bbl//day (MMbbl/d) and prices are expected to remain below $50 US. No price relief is in sight for Canadian producers. Moreover, the US has now almost doubled its domestic production to 9.5 (MMbbl/d) and just last week authorized crude oil exports to Mexico. 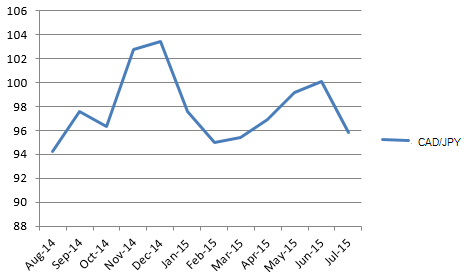 Given these market conditions, Canadian exports are unlikely to exceed the current level of 3 MMbbl/d. 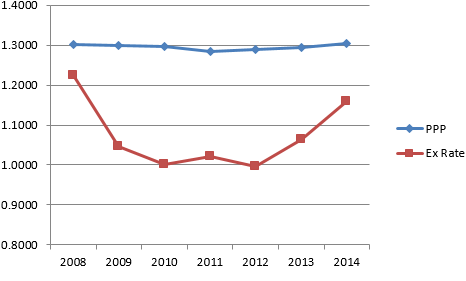 Looking at the longer term, Canadian production is “landlocked” in two respects. First, Canadian producers are not able to expand significantly into the US, without the approval of the XL Pipeline. Secondly, Canadian producers have no means to export oil to Asian markets; currently, pipeline proposals from Alberta to BC ports are mired in regulatory and political issues concerning royalties and environmental controls. Normally, one would expect that a depreciation of 25% would boost manufacturing export volumes significantly as has been the case in the past. However, there are serious impediments operating today that will mute any expected increase in the volume of manufacturing exports. The importance of the auto sector cannot be over-emphasized. Canada is the 9th largest vehicle producer in the world., It is the single largest manufacturer, employing directly and indirectly 550,000 workers1. It is widely accepted that Canada suffered from a relatively strong dollar ( at times over par with US) prior to 2010. It is estimated that Canada lost 5% of its share of the North America auto assemblies2, in large measure due to an inflated currency. Individual states made successful bids to have auto plants re-locate in low wage and non-unionized states, as part of a renaissance in manufacturing in the US. The rise of the Mexican auto industry is a large part of the story of how Canada’s share of the continental auto market fell from 19% to 14%- the lowest level since 19873. This decline was significant, given that both Canada and Mexico experienced a depreciation of their respective currencies. The loonie/peso exchange was largely unchanged all the while Mexico increased its share of the North American automarket. Mexico was able to exploit its low-wages and proximity to southern US markets. . The Mexican auto industry has received $US 7 billion in new plant and equipment, while only $750 million has come to Canada in recent years4. It is unlikely that Canada can recapture its lost market share. It is unlikely that Canada can recapture its lost market share in the auto sector. 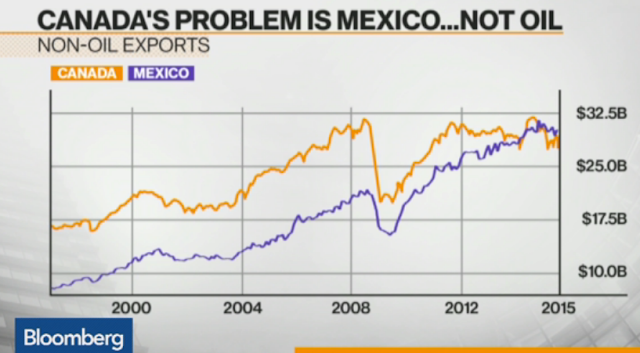 The rise of Mexico as rival to Canada as an exporter to the US is now becoming more apparent (see Chart 7). Led by the shift in automotive production as well as other manufacturing, Mexico can expect to make a dent into Canada`s share of the US market for manufactured goods. Is the Loonie Priced Right? One way to consider this question is by measuring Canada`s “Purchasing Power Parity” (PPP). PPP states that the exchange rate between two currencies are in equilibrium when their purchasing power is the same in each country. In other words, what exchange rate will equalize the price of an identical good in both countries, expressed in the same currency (USD). Granted the measure is less than perfect for many reasons. However, it does offer an insight in whether the loonie was "appropriately" priced in order to maintain our competitive position in the US market. Chart 8 maps the PPP for Canada against the loonie since 2008.. The measure strongly suggests that the loonie was overvalued by as much 25-30% since 2008. The recent devaluation, started in 2013, has now reached a level of 1.30 (USD/CDA), matching the PPP measured achieved in 2014. Thus, the gap has closed and the currency is in better balance with the US. Time is needed for the full effects of closing this gap to be felt, since there is a considerable hangover from the days of an overvalued currency. The super cycle in commodity prices has come to an abrupt and hard landing. As a major resource producing country, Canada has to accept its fair share of declining revenues as the world adjusts to slower growth and deflation. As long as the terms of trade continue at these levels or below, the balance of trade will be negative, necessitating the inflow of capital to balance our international payments. Structurally, Canada`s non-energy exports face stiff competition from Mexico, especially in the automotive sector; both countries are keenly aware of the need to keep their currencies from appreciating against the US as they both fight for market share. All this begs the question: is the USD/CAD 1.30 exchange rate sufficient to allow trade to make a real contribution to economic growth? Given these headwinds, a further depreciation will be needed.